When you’re in the process of closing on a home, there are a few individuals you’ll encounter the day you cross your T’s and dot your I’s, and each one plays an important part in helping you complete the home buying process. One of these individuals is the notary public (in the closing process, referred to as the notary signing agent). Since notaries play an important role in the closing process, let’s break down who they are, what they do and the benefits of having a notary during the closing process. What Are Notaries and How Are they Different from Signing Agents? A notary acts as a witness during the signing process of important documents, such as your closing documents. In other words, they’re legally authorized to sign (referred to as “notarize”) official documents and statements. According to the National Notary Association (NNA), they are individuals appointed by state government to be present during the signing of important documents and to validate that you aren’t being pressured to sign on the dotted line. Their presence protects you, the signer, as they’re entrusted to confirm your identity before signing any official documents. They do this by validating a current ID that contains a photo, physical description and signature (like a driver’s license or passport). This process is intended to prevent fraud. In the home-closing process, there‘s a specific type of notary called a notary signing agent (NSA) – these are notaries who are specifically trained to handle and notarize loan documents. They’re the last link in the closing process that legitimizes the closing documents to complete the loan. How Does a Notary Work? NSAs protect you by validating your identity and ensuring that you understand exactly what you’re signing. They traditionally have to be present during this time. According to the NNA, your willingness to sign the documents “without duress or intimidation” is crucial. You, the home buyer, may be required to take an oath declaring your identity and understanding of what you’re about to sign. The NSA’s job is to make sure you’re completely aware and willing to sign any documentation placed in front of you. Because this is an important part of the closing process, the NSA has to be impartial, with no personal interest or bias concerning the documentation. After the signing is complete, the NSA will add their signature, seal and notary commission (license) to the documentation, therefore notarizing your documents. Without the notarization, your documents aren’t considered valid and your state won’t accept the documents once they are sent for recording. 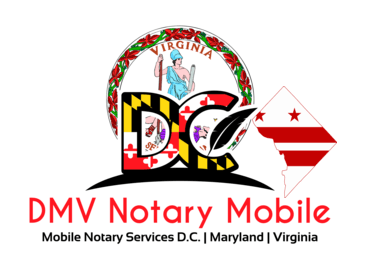 The title company may select a NSA close to your location to complete the signing or you may reach out to DMV Notary Mobile to help walk you through your loan signing. Once the selection has been made, the NSA will reach out to you to make an introduction before coming to your closing location. This is what is known as a traveling notary, one who travels to meet clients in person and who is typically used as part of the mortgage closing process. As we’ve touched on above, notaries are impartial and unbiased, and are there to make sure you understand what you’re signing before you sign. They’ll confirm your identity before signing documentation and are responsible for mailing the completed documentation for official recording. They’ll also come to meet you wherever you predetermine for the signing process. Plus, here in Washington DC and Maryland, you may be required to provide a witness and have them sign the mortgage. While there are other things that will happen at a home loan closing, we hope we’ve broken down the importance of the notary’s part and how they help ensure a smooth closing process. Do you have more questions about notaries and notary signing agents? Call us at (202) 826-8179 or fill out this short form to get a quote. What is the Difference Between a Notary Public and a Notary Signing Agent? Can't find a Notary Public? We'll come to you!